After numerous suggestions from my many readers, (I think there are 6 of you), I am posting the photo of Pearl along with the story behind the photo. Pearl thanks you for your recognition and will be available for autographs soon. As many of you know, I have been living at Devin’s house while she and her non-husband traipse around the lower 48 for 8-10 weeks. This tied in beautifully with my situation since I had rented my house and had no particular place to live until I found a motorhome. In exchange for lovely mountainside accommodations at Chez Devin, I was to water plants, take in mail, and play companion to her delightful standard poodle, Pearl. Misty, Mosely, Pearl, and I enjoyed a fabulous 2 1/2 months together and were expecting Devin back on Sunday. Those of you who know me, know I am procrastinater extraordinaire AND am the Oscar of the Felix and Oscar Odd Couple. Given this, you can image the state I was in when Devin texted Wednesday saying she would be home Friday instead of Sunday. Boy howdy did I shift into high gear and after 12 hours of packing and cleaning on Thursday and another 8 on Friday, I had pretty much removed all signs of my presence leaving behind a clean, cyclone-free home. Whew! Throughout all of the hubbub, the dogs were getting increasingly nervous as those of you with pets will understand. Bring out the packing boxes and/or suitcases and our four-legged friends go on high alert and don the most pitiful of wary faces. 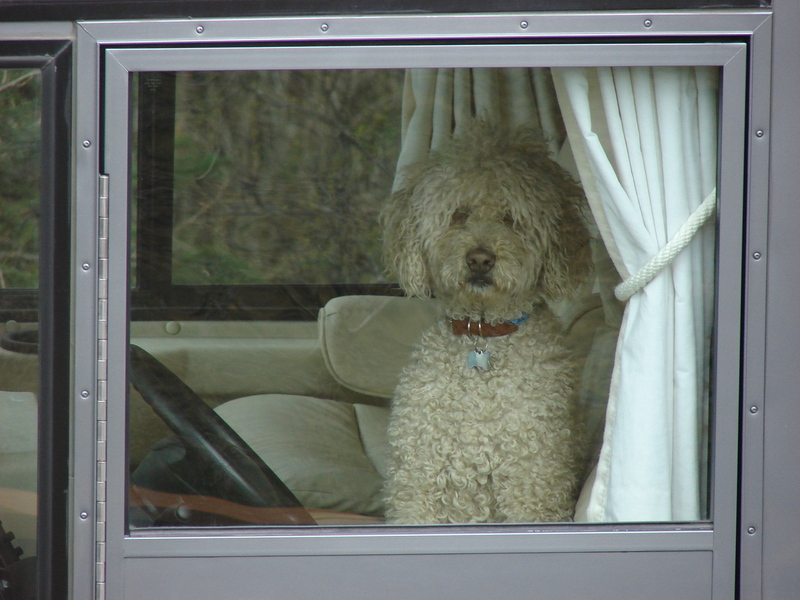 All three dogs were underfoot constantly during every trip from home to motorhome and back again. No one was about to be left behind, that’s for sure. It was Pearl who came up with the best plan ever. Being the smartest of the group and I include myself in the group, she realized she didn’t have to keep following me back and forth, but could stake out a prime position and therefore keep tabs on things without moving. A well-chosen position would guarantee she would go where ever I went. Being the critical thinker she is, she chose the driver’s seat of my new house! What a smart girl. As you can imagine, her plan worked beautifully. She was never left alone, but was handed over personally to Devin upon her return. Margie: You are so funny. I hope you are keeping all of these posts. I know that someday a “book is in the making”. And a great book it will be. Oh, I love the Pearl story and will share it with others. I, too, will be awaiting the travel tell-all. I am still smiling!! How cute is this. Doug Hunt forwarded the picture and story of your new “home” and now the tale of Pearl so I am hooked…………keep me posted as this is going to be a grand adventure and I am so jealous. When we bought our houseboat, it was a toss up between a motor home and the boat and we too had an adventure, yellow Lab Champ included, taking the boat from FL to NC. Wouldn’t you consider taking Pearl along with you??? ?